It looks like Florida is finally getting another touch of cooler weather this week! I don't think the rest of the world really understands Florida winter until they experience it first hand. It is 80 degrees the first few days this week and will be in the 40s when I get up for my Saturday morning run this week. We get all ends of the extreme. I also have lots of new winter clothes I've been hoarding for the past couple of months that I have yet to be able to wear. I think I like to pretend that Florida gets way more extreme weather than it actually does and that I really need the 20 or so sweaters stuffed in my closet. What can I say, I like options. I made this chili shortly after our return from the UK when cooler temps were still lingering. It was the perfect comfort food to come home to and made lots of leftovers which was ideal for my first week back to work. Anything that allows me to toss it all into the crock pot and not worry about it for hours is always going to be a winner. Randomly enough, I got the idea to fill up a butternut squash with chili after reading about it in a book. I screenshot the idea and knew that was going to be one of the first recipes I made when I got home. For Andy and I, I prepared it both ways. While Andy is willing to eat just about anything, I knew he'd rather just eat his chili in a bowl. I loved the softened squash at the end of each bite of chili. The flavors were delicious together. 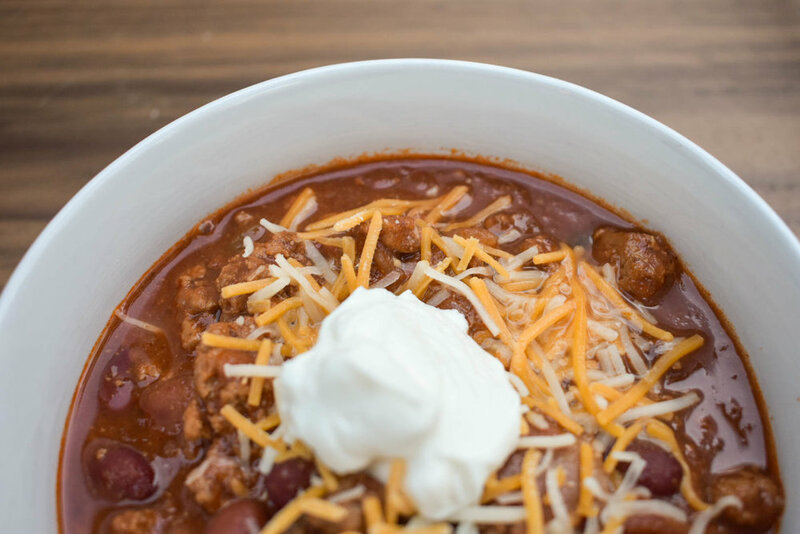 If you don't want your chili served in your squash, just cube it up and toss it in your bowl. Heat oil in a skillet over medium-high heat and saute the onion and garlic for about 3 minutes. Add to the crock pot. Add the ground turkey to the skillet and cook until no longer pink. Drain excess fat and add to the crock pot. To the crock pot, add in the diced tomatoes, tomato sauce, seasonings, 1/2 c. water, and salt and pepper to taste. Stir until fully combined, cover, and cook on low for 5 - 6 hours (the longer the better!). Drizzle the insides of the squash with olive oil and sprinkle with desired salt and pepper. To a baking dish, add your squash, insides face down, with 1/4 c. water. Bake for 40 - 45 minutes. Allow to cool slightly. Top with desired chili toppings. *If you don't want to eat the chili out of the squash, simply cube the squash, add it to your bowl, and serve the chili over top.